I really don’t know what everybody’s worried about – I mean, it’s just a little bit of oil. It’s not like the Gulf of Mexico was pristine to start with, you know. Sure, it looks like a massive disaster if you’re at ground level, but if you look at photographs from above – like from satellites – it’s just a little dot of oil sitting in the big blue ocean. And people are getting upset over that? Please! We’ve been dumping garbage into the Gulf for years and nobody’s said a thing. But lose one little oil platform, break one little pipe, leak out a little bit of oil and natural gas, and everybody’s up in arms thinking the world’s coming to an end. Did the world stop revolving when the Exxon Valdez ran aground in Alaska? Of course not. 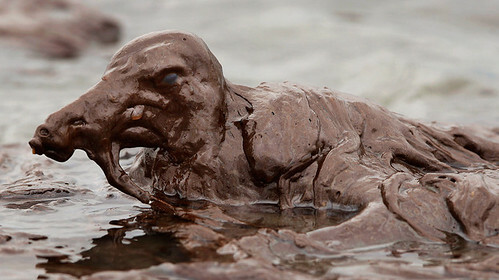 Did the Gulf of Mexico turn into a tar pit when 3 million barrels of oil leaked out from the Ixtoc I in 1979? I don’t think so. And do you even remember how much oil was spilled in 1991 during the Persian Gulf War? Well over 460 million gallons. But since it didn’t happen in America, who cares? If we’re going to live in a modern fossil fuel society, we’ve got to be prepared for a little bit of bad in order to have a whole lot of good. Okay, so maybe we won’t see much shrimp come out of the Gulf this year, but that doesn’t mean the end of all shrimp harvesting. There are plenty of other places where shrimp come from. Besides, if worse comes to worst, some enterprising young chemist will figure out how to make a shrimp substitute from soybeans – maybe call it Soy-Shrimp – and it’ll probably be healthier for us anyways. Okay, so there are some wetlands that might be affected by the oil spill. But come on folks – they’re wetlands. It’s not like you can build a condo or shopping mall there. And yes, a couple of fishermen will go out of business because of the Gulf fishing ban. But do we really need fishermen anyways? We live in the 21st Century where humankind doesn’t need to hunt and forage for food. We can buy all the fish we want at Wal-Mart and never have to even touch a fishing pole. The knee-jerk reaction to this little oil spill is to say let’s wean ourselves off of oil completely, but can you imagine what would happen if the “tree huggers” had their way and all production of fossil fuels was halted? Yes, our air and water would be cleaner and dolphins, pelicans and turtles would all be happy, but our economy would crash, and you, me and my Aunt Edna in El Paso would have to pay premium prices for things we buy on the cheap today. No more cheap fuel, no more synthetic clothing, we’d have to drink water from the tap instead of from plastic bottles, and Hasbro would have to stop mass producing those wonderful G.I. Joe Action Figures. Sure, we could all go back and live the way our Native American ancestors lived – make our clothes out of natural materials, walk around a lot, hunt for only what we needed to survive, make as little impact on our surroundings as possible – but we sure would stink. Indians didn’t have Old Spice High Endurance Deodorant with its easy-to-use turn-dial stick applicator, guaranteed to provide 24 hours of odor protection with a clean and crisp, sporty fragrance. I don’t know about you, but I’d rather wade through an ocean of garbage than to have to work all day with a bunch of stinky people. To conclude, humans are a remarkably adaptable species. If it’s too cold, we put on a coat; if it’s too hot, we wear shorts; and if our environment is a little bit polluted, we look the other way and keep on truckin’. We don’t notice the illegally-dumped tires in the ditch or the empty cardboard beer case on the side of the road or that the sky looked a little brownish this morning. And why not? Because we’ve adapted to our environment, and those little annoyances are just that – annoyances. Well, that’s my two cents concerning the whole matter. I hope I made it perfectly clear on which side of the issue I stand.